Riga-class (frigates of the 1950s, project 50) Any information on the shown versions? Project 78 (cruiser/training ship, 1920-1950 built) Any information on this? Mariupol ex-Ion C. Bratianu (Soviet ex Rumanian river monitor) since when did she carry the 1944-armament? What did she carry as armament then? 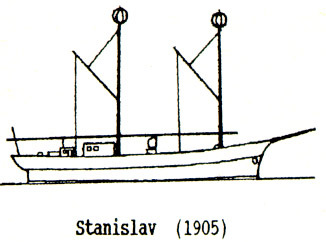 Russian/Soviet river monitors/gun boats: Where can I find line drawings? Zhelezniakov (Soviet river gunboat) Is this the original condition? If not, since when did she looked like this? Who can tell me something about this Russian ship of the line, built 1766?? Name: Tri Hierarches ? Who can identify this Russian floating battery (project?)? "Armed floating battery, Russia 1865"
Who can tell me something about this Russian gunboat/battery/...? "Armed floating battery, not self-propelled, Russia 1905"
Mikoyan Gurevich MiG-29 versions: any information? Suchoi Su-27/Su-30/Su-34/Su-35 versions: any information? Please visit this page on Russian guard launches. To see this page in Russian: Online translator.